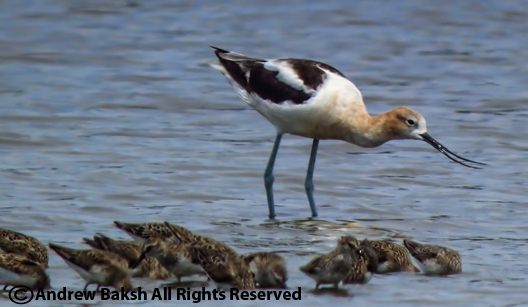 American Avocet on the East Pond at Jamaica Bay Wildlife Refuge. The 3rd Avocet on the pond that I have seen and documented for this season and it looks like our 2nd female. 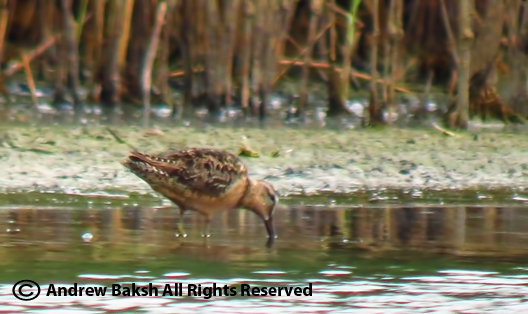 This is a much better photo of the Long-billed Dowitcher that I found last Thursday. Photos forensics indicate the same bird. 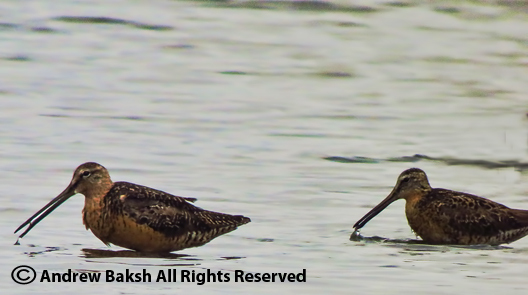 I have better photos, but I have yet to get to them, so enjoy this one with a Short-billed Dowitcher in the same frame for comparison. 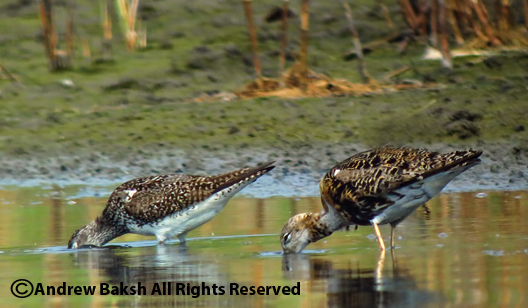 Last year we had a total of 4 RUFFS, on the East Pond at Jamaica Bay Wildlife Refuge. This year we have two so far with RUFF number two found this morning on the East Pond by Jim Schlickenrieder and perhaps a couple other birders?? (I noted 3 other birders with him). I had not planned on the East Pond today and instead had designs on birding out on Eastern Long Island, but a late night foiled my plans + coupled with only 2 hours of sleep - it was not going down well. I decided to play it safe and avoid the long drive and so it was back at Jamaica Bay. I was on the pond by 6:00 a.m. deciding to go in from the South End to scout out the Long-billed Dowitcher I had found on Thursday. That bird had found a corner on the south end to its liking and so it was there yesterday feeding quite contently with a few Stilt Sandpipers and I was able to pass on that intel to Ann Lazarus and her crew who got good looks. (Ann as always sent a thank you note - a polite but important gesture not often practiced in the field). Much appreciated Ann! The LBDO was not there and so I slowly worked my way up north checking like I always do every little nook and cranny for anything that might be quietly feeding. It was way early before high tide so there were not many shorebirds in as yet, but 3 juvenile Spotted Sandpipers made for enjoyable views. Once I got to the Raunt (ruins), I scoped way up north to see what I could make out. Believe me on a good day with no shimmer and just enough light you would be amazed what you could pick out up north from that distance. I could see some shapes of shorebirds and size with some indicating Dowitchers. There was one bird that looked heavy and long legged but that is about what I could tell. I started up the next portion of my schelp and I felt the phone vibrate indicating incoming e-mail. I quickly checked and read the report of a RUFF from Jim. SWEET, I thought I was not feeling too bad anymore about not making it out east. I hurried up to the north end where I saw the bird feeding but it did not look quite settled and soon after it flew heading south. It appeared to be heading off the pond but to be sure I walked all the way back to the South End and looked. It was not there, but I was gambling that it had only left to feed in the bay and would return once the tide turned. By then Jim and I had exchanged phone numbers via e-mail so that we could get in touch with each other should either of us saw the bird if it returned. 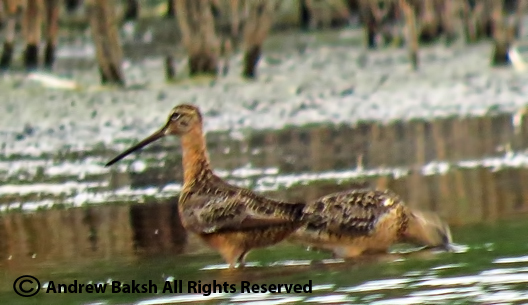 Sure enough, around 10:25 a.m. Jim texted me that the bird had flown in on the west side (the side he and the 3 other birders were on) and was feeding amongst the Short-billed Dowitcher flock - for well over an hour this continued. Other birders arrived, most of them coming in from the North End; I got better looks, but it got even better when the bird flew across the pond and came over to my side (I won't get into to details, but thank you folks I knew it was going to happen and silently urged you on). I enjoyed studying the bird getting some photos and video, plus it was fun trying to keep photographer Steve Walter at bay - sorry Steve if you missed the great shot you wanted. Steve was a good sport and I left him on the pond in search of that glorious shot. 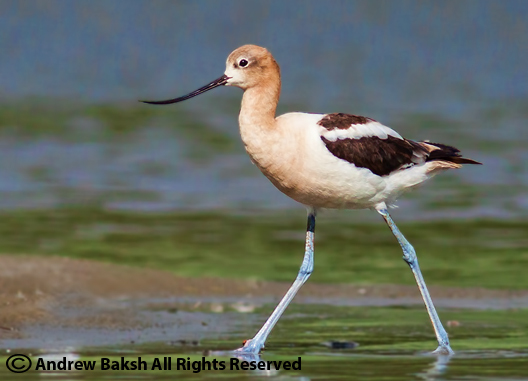 The morning then got EVEN better when birder Ken Feustel called to report that a couple had passed on to him intel of an American Avocet on the South End of the East Pond. Acting on this, Ken who was on his way out on the South End, found the bird and called me while looking at it in his scope. Isn't technology wonderful? I later saw this bird as I made my way back out on the South End and found out that the couple was birder Keith Michael and his friend. Thank you Kieth!! So how is that for a day that I thought would be ruined because I could not get out to bird east? Pretty RUFF don't you think! 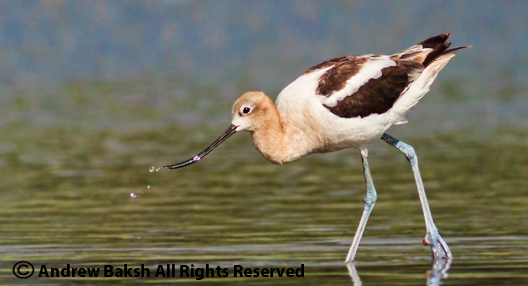 With the cold front moving through the area, shorebirds took advantage of the weather to press on with their journey. Today on the East Pond at Jamaica Bay there were fewer birds than in the past days. 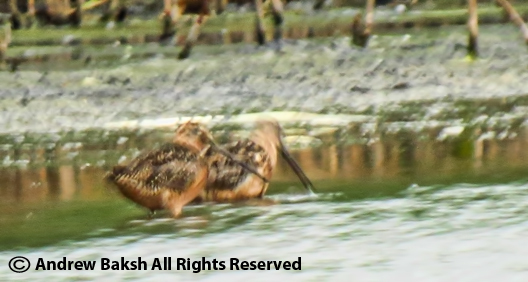 The highlights were 1 Long-billed Dowitcher, 1 Western Sandpiper and a couple of White-rumped Sandpiper. 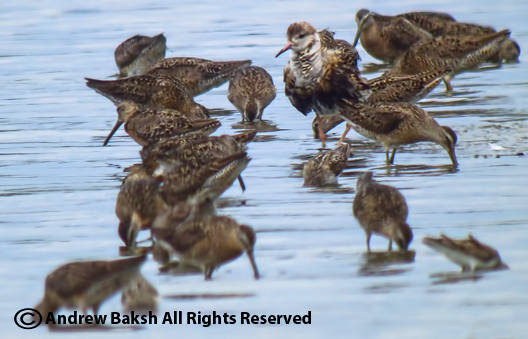 This report covers Sunday July 21st 2013 when I recorded the highest number of shorebird species to date for the East Pond with 17 in total. 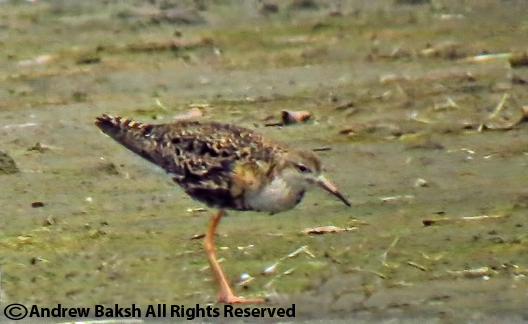 The highlights of that day was the continuing RUFF and the Adult BAIRD's SANDPIPER in transition plumage. Both these birds have not been seen since Sunday and at the end of the report I will add some notes on the changes that have occurred with the volume of birds from Sunday. Here are the shorebird numbers as recorded on Sunday. Note: these counts cover the entire pond often birding from South to North and back or vice versa. As of today, the shorebird numbers were still decent but there has been a noticeable exodus of birds as well as arrivals. 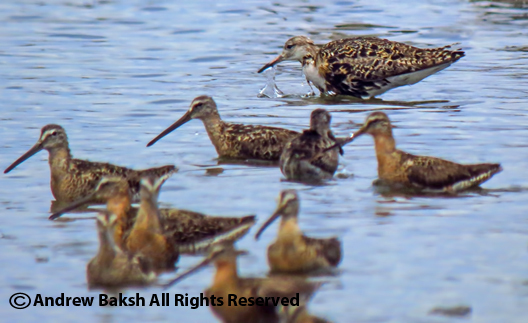 Birds such as the RUFF, BAIRD's and the 4 PECTORALS have not been seen since Sunday and have presumably moved on. 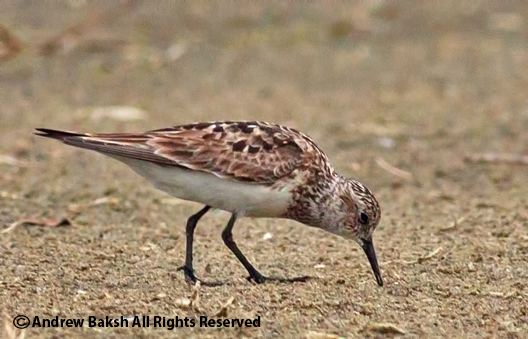 The Short-billed numbers continue to decrease but the Semipalmated Sandpipers have bumped back up. 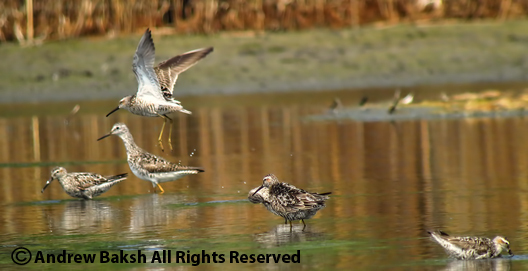 A lone WESTERN WILLET that dropped in briefly on the pond on Tuesday July 23rd was new, adding to the diversity. Juvenile SPOTTED SANDPIPERS are the only juvenile shorebirds on the pond at the moment, which is right on par with the schedule for juvenile arrivals. As always, dress properly with knee high boots to bird the pond. Make sure you have sun screen, water and insect repellent if you plan on being out on the pond for while. 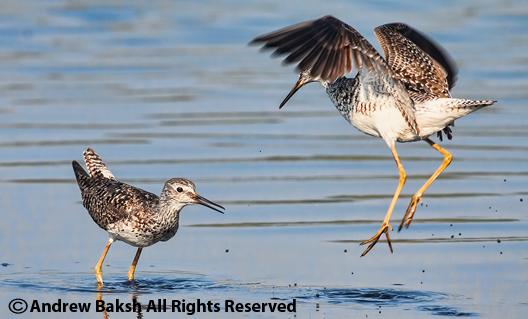 Keep checking the blog for updates on shorebird movement at Jamaica Bay. Stilt Sandpiper playing "Leap Frog"
FYI...Don't just look at the shorebirds, there are other interesting birds on the pond such as a drake eclipse Blue-winged Teal; worth a look at if you are on the pond and happen to scan the waterfowl. The young Least and Forster's Terns are also nice to look at. 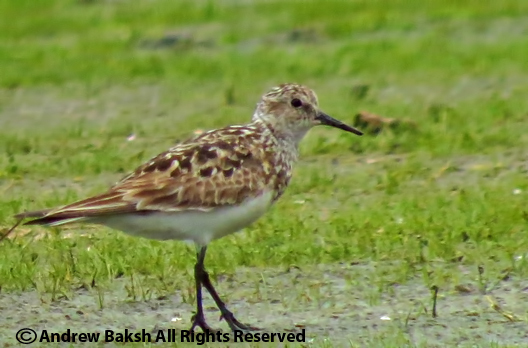 So, my instinct was right, it turned out yesterday's puzzling Calidrid was indeed a Baird's Sandpiper in molting/breeding plumage. (Better to call it a very worn transition from breeding plumage Baird's that has replaced a good number of breeding feathers with nonbreeding ones, and whose tertials appear to be very worn retained juvenile feathers. So probably a late first year bird that may or may not have bred, but probably flew to the breeding area - Kevin Karlson see his comment) When I put up my blog post this morning around 4:00 a.m., I had by then done some homework, looking at Baird Sandpiper images in different plumage from several sources including the Crossley Guide and the Shorebird Guide. 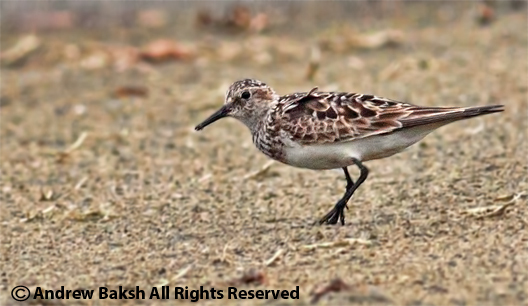 Some photos indicated that the bird looked good for a breeding plumage Baird's Sandpiper but having never seen one, I was being cautious and did not want to arrive at a reckless conclusion. My field notes from yesterday noted that for the short time I observed the bird it did not enter the water but fed on the shore. Typical of Baird's Sandpiper behavior but not a hard and fast rule as I was reminded of today by Angus Wilson who responded to my query with tips on what to look for. Today, when Isaac Grant and I came upon the bird, it immediately struck Isaac as a Baird's although he too admitted that he had never seen one in this plumage. Further observation with Doug Futuyma, Steve Walter and confirmation from Shai Mitra, Patricia Lindsay and Holly Wilson who had distant views of the bird settled any doubts. My thanks to all who responded with congratulatory messages and advice. 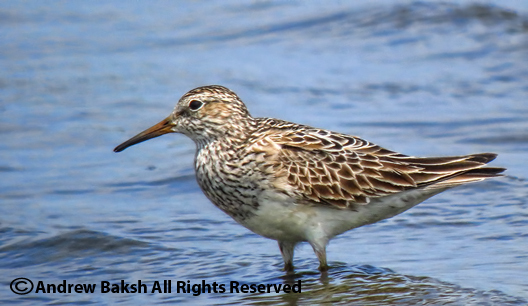 Baird's Sandpiper in this plumage is a rarity for our area and I am not even sure how many downstate records we have. Here are some additional photos I took today with better lighting conditions. Who has the better looking legs?